There is no time and no place better for playing golf than October in Tallahassee in Golden Eagle Plantation. The world class Tom Fazio golf course attracts Tallahassee's most dependent golf addicts, and a world class neighborhood has been built around the course in order to contain them. With an assortment of construction styles, even non golfers should consider looking within the gates of Golden Eagle if in the market for a home priced above $500,000. 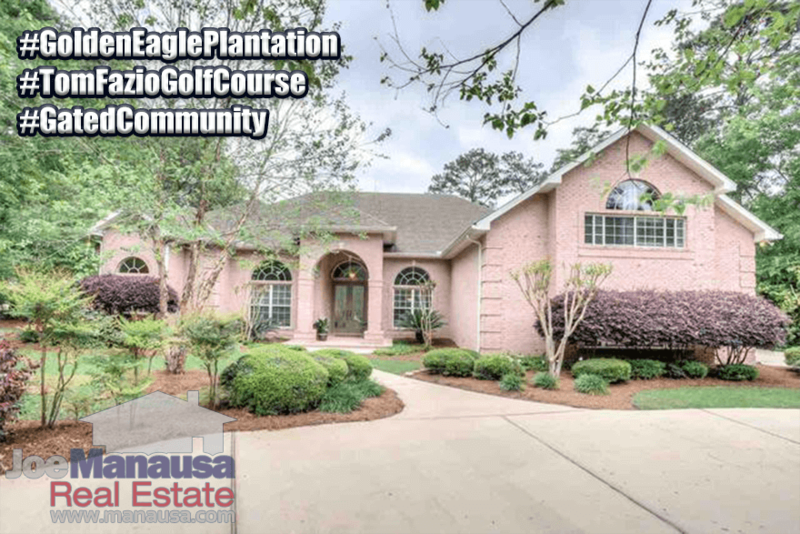 Located at the heart of the Killearn Lakes Subdivision, Golden Eagle Plantation features 800+ large homes, a country club, and of course Tallahassee's most challenging golf course. The Fazio course was built in the 1980s and is the favorite among the better golfers in Tallahassee. The narrative contained below is for sales through December for all past years and through September in 2016. 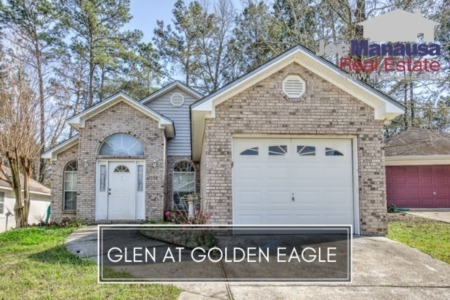 All the graphs and the closed sales table will be continuously updated into the future (meaning bookmark this page if you always want to know the current status of homes in Golden Eagle Plantation). Average home prices are up less than 1% over all of last year's average. Current home prices are now roughly 20% lower than they were at the peak of the housing market in 2007. The current rate of home sales in Golden Eagle Plantation is just short of record-high. When we look at existing homes for sale (and remove duplicates and proposed construction), only 17 homes are available right now, and 5 of them are already under contract. So 12 homes are available, and 50 have already sold and closed this year ... this is the best conditions have been for Golden Eagle homeowners in more than 10 years. 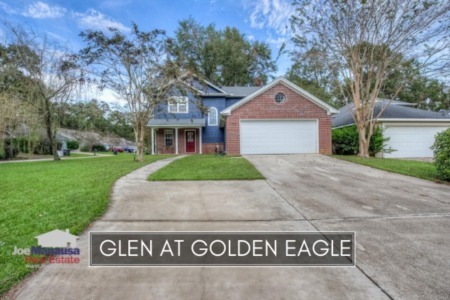 Currently, the average home price in Golden Eagle Plantation is $472,500. Golden Eagle Plantation average home values are up nearly 3% in 2016, and perhaps this is why buyers are still snatching up the inventory. The rate of appreciation has grown since our last report and is likely to push even higher over the next few months. The average value of a home sold in Golden Eagle Plantation in 2016 has been $143 per square foot, up roughly 13% over the bottom reached in 2013, but still down about 20% from the market high set back in 2006. This means that many homeowners who have purchased or refinanced in the past 10 years could owe more on their homes than they could get with a sale today, but rising values is reducing that pool of homeowners every month. The average home size sold in Golden Eagle Plantation typically falls in a range of 3,000 to 3,500 square feet, and this year is no different. The 36 homes sold in 2016 averaged 3,283 square feet. The following list shows more than 1,000 home sales in Golden Eagle Plantation going back to 1991. I hope you enjoyed our October 2016 update on home sales in Golden Eagle Plantation, please feel free to drop me a note if you have questions not covered in this report. There Are 3 Types Of Home Sellers, 2 You Must AVOID Or You Will Lose!